The Dark Drake Pauldrons feature a unique raised pattern. This pair fits just about any character from any period. Each is comprised of a large shoulder plate and four smaller lames that protect the upper arm during LARP combat. Made from 18-gauge mild steel, the shoulder plates possess a dark metal finish, coated with a rust and scratch resistant treatment. A scale-like pattern with raised ridges, rivets, and rolled edges increase their deflection capability. This set includes the besagues. Leather cording secures them to the pauldrons. Adjustable buckle straps hold the shoulder plates to the upper arm. 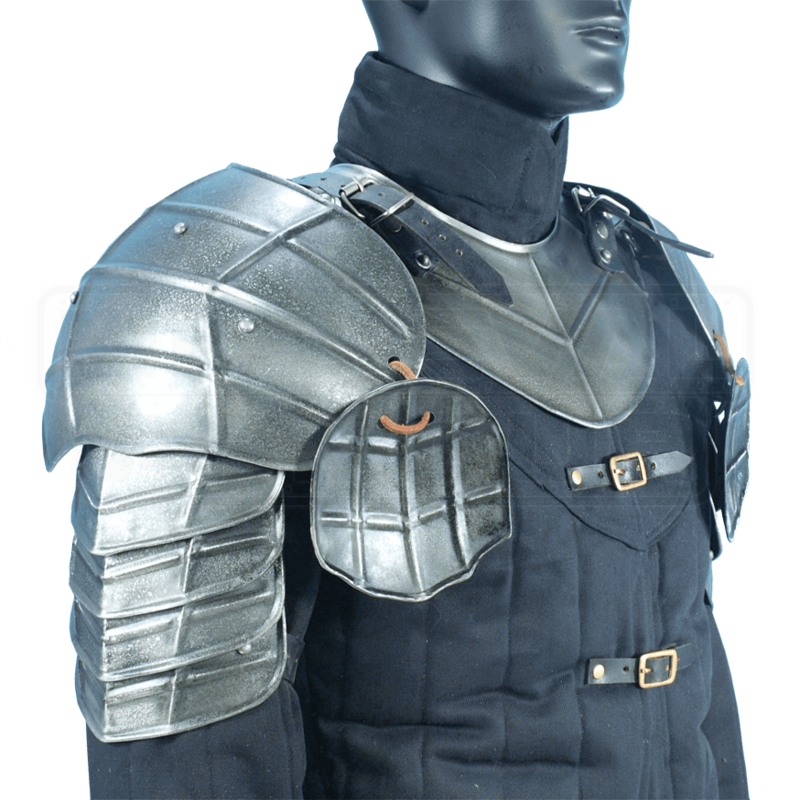 The shoulder straps aid in customization, allowing you to combine this pauldron set with a gorget, cuirass, and other attachments. The pictured Dark Drake Gorget is available separately. The Dark Drake Pauldrons are great! I was a little pessimistic because of a back order issue last year with another item. This time however, I received my order in a very prompt fashion and I am very pleased. The quality and durability of the pauldrons are amazing. I tried them on with the Dark Drake Gorget and had a friend hit me hard in the shoulders with a long sword. I felt a little sting, but what do you expect. This is an awesome product!